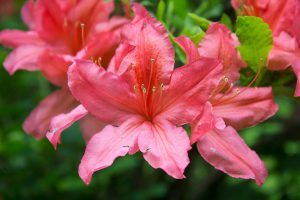 In the 1930s and ‘40s, thousands flocked to Lafayette to view the vibrant colors of blooming azaleas along the Azalea Trail, a designated tour that linked city property with large swaths of azalea bushes. After years of lying dormant, the Lafayette Azalea Trail has been resurrected in the hopes of building tourism as well as community pride, said June Faul, chairperson of the Azalea Trail Revitalization Group of the beautification organization Scenic Lafayette. On Saturday, March 18, Scenic Lafayette will host Azalea Trail Day in downtown Lafayette to raise funds and build community awareness. The event will include a classic car caravan and motorcycle cruise, live music, vintage market, azalea plantings, costumed bike ride and more. The trail began in the early 1930s, but became official in 1938 by the Lafayette Garden Club. For decades the trail was immensely popular, attracting visitors to view the thousands of East Asian flowering shrubs that bloom in early spring. An estimated 40,000 people visited the trail by the 1940s, arriving in Lafayette on tour buses, Faul said. In the 1980s, it was named a Top 20 Tourist Destination by Southern Living magazine. Over the last couple decades, however, the trail disappeared. It fell by the wayside because of urban decay and the demise of the Jaycees, which had overseen the trail in its last days, according to Faul. Faul, a board member of Scenic Lafayette, did an inventory of the city’s azaleas and began discussing a resurrection of the trail with the Lafayette Economic Development Association and gardening-related organizations. They designated azalea hotspots and created a map and considered bike rides and pedestrian access in addition to the traditional car route, Faul said. The present Azalea Trail is 16 miles long with St. Mary Boulevard as its “major spine.” Even though maps have been printed by the Lafayette Travel and Visitor’s Commission, it’s a work in progress, Faul said. Today’s Azalea Trail winds through downtown Lafayette where Scenic Lafayette has resurrected plants once suffering from lack of watering and bug infestation. Loops include St. Mary Boulevard, Mouton Gardens, Bendel Gardens and Greenbriar. Trail corridors include Jefferson Street, Coolidge Street and West Bayou Parkway. The March 18 event is both a fundraiser and an opportunity for community outreach on both the trail and the beautification efforts of the city, said Robert J. Guercio, Scenic Lafayette chairperson. “Our goal is to raise funds to help pay for the revitalization of the trail,” Guercio said, adding that future plans call for pocket parks, Azalea Trail promotion and restoring sites to their former grandeur. Funds raised will also be used to eventually hire an executive director to manage the ongoing efforts of promoting and sustaining the trail, he added. Both Faul and Guercio believe the trail should be aided by a collection of organizations such as Trees Acadiana, Project Front Yard and One Acadiana. “Our mission is to establish an organization with key partners and stakeholders to ensure long-term viability of the Azalea Trail,” Guercio said. The bottom line of revitalizing the trail, both members say, is the beautification of the city and the pride that results from such projects. For more information on Azalea Trail Day, visit Scenic Lafayette’s Facebook page.